As Mikaël Fogelstrom aptly pointed out in his TED Talk, materials have been the ground layer for advances in technology since the beginning of history. We made tools firstly from stone, then bronze, and then iron. Later, we developed technology to break materials down to their atoms and build new tools from there. It gave us silicon and the semiconductor and the interconnected modern world in which we live nowadays. The new and insanely promising material is actually nothing really special and has been around for ages. It is a very interesting structural variety of plain old carbon (also called an allotrope). Carbon has many allotropes, such as diamond, but the most common allotrope of carbon is actually graphite, which is used to make pencils for instance. 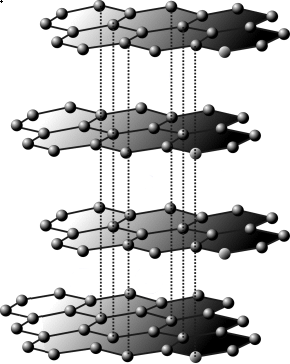 On an atomic level, graphite is essentially composed of stacked sheets of carbon atoms. A single sheet of graphite is called graphene and it now has a separate name because graphene on its own has completely different electrical, thermal and physical properties than when sheets of it are stacked into graphite. Graphene has been theorised since 1947, but it took until 2004 to actually isolate just a single layer of graphite in a laboratory. At the University of Manchester, Andre Geim and Kostya Novoselov used adhesive tape to lift off layers of graphite and put it on-to another material. They repeated this process until they had a layer which was just one atom thick: graphene. Their work was considered ground breaking and the expectations of graphene changing the world were off the charts. Geim and Novoselov won the Nobel Prize in Physics in 2010 for their work, although at the time, graphene still had to prove its application potential and the production cost highly outweighed any return on the investment. So why is graphene so interesting? For starters, if sheets of graphene contain enough atoms, they become stronger than steel. Secondly, because it is only one atom thick, it is extremely light. These two physical properties make graphene interesting for all sorts of applications in construction. However, perhaps even more promising than its physical properties are its electrical properties; graphene is highly conductive, even at room temperature. Combined with its two-dimensional structure, this electrical property makes graphene extremely interesting as a possible alternative for silicon in microelectronics. Silicon is predicted to have reached its limits when it comes to scale; graphene could go much smaller than silicon ever can. At MIT, graphene is tested as a water filter, desalinating salt water leaving fresh drinkable water. This experiment may open up all sorts of purification applications involving graphene technology. Experiments conducted by Rice University and Moscow State University have shown that graphene oxide can quickly absorb radio active material from contaminated water. Researchers at UCLA have found a technique to use graphene super capacitors that can charge in just a fraction of the time it takes conventional batteries to charge. Although dead phone batteries may be something of the past, the same technology can be used for pace makers and electrical cars. In the consumer market, graphene’s conductive properties could also be applied in touch technology, making plastic touchscreens for mobile phones a serious alternative to the current, very breakable, glass touch screens. In his TEDxBrussels talk in 2014, Jonathan Coleman made graphene on stage from pencils and a kitchen blender and explained applications such as graphene printed light sensors, graphene soaked rubber bands serving as highly sensitive motion sensors that can be used to measure muscle strain and can track the breathing of newborns. All in all, graphene is a potential super-material, if it weren’t for the high cost of producing it in pure form in large quantities. Fortunately, since the adhesive tape technique that is obviously not suitable for mass production, researchers have continued to work on alternatives and high-quality graphene has proved to be relatively easy to isolate in ever increasing quantities. Lowering the cost of graphene mass production may finally unlock this material’s full potential. Graphene will replace current materials, and in the future, the properties of graphene will enable future applications that we can’t even begin to imagine at the moment.